This Lost At Sea is yet another book that I treated myself to after it had been stolen from my classroom. This (the one pictured above) is not the original copy that I had, but it will do. I’m happy to have it back in my collection, and it will not be leaving my house…unless you really want to borrow it; it’s really good. I am two years older than Bryan Lee O’Malley, and I must say, I’m impressed by how well he continues to keep his pulse on what it’s like to be young. From Scott Pilgrim, to Snot Girl, to Lost At Sea, to Seconds, O’Malley is better at capturing the tumultuous nature of adolescence than just about anyone. Lost At Sea brings us the tale of Raleigh, a girl that believes that her soul is lost and might possibly be in the body of a cat. I know that sounds strange, but the book is not that strange. Actually, it’s a pretty good depiction of what it means to be young and confused in those times right out of high school; I guess we’ve all crazy thoughts. Raleigh ends up on a road trip with a group of kids from high school as they travel from California back to their home in Canada. The book is rich with teenage dialogue, including an abundance of the F-Bomb, which gets it its 17+ rating. But don’t let that shy you away from giving this book to a young person that’s having a rough time finding themselves. It’s rich in its honesty, and many young people will find themselves in it. The art is simple but elegant: the style O’Malley is known for. If you’ve read any of his other books, you will not be shocked by the Lost At Sea art. Beautiful use of blank space and a surprising amount of emotion from simplistic faces makes this a par for the course O’Malley book. 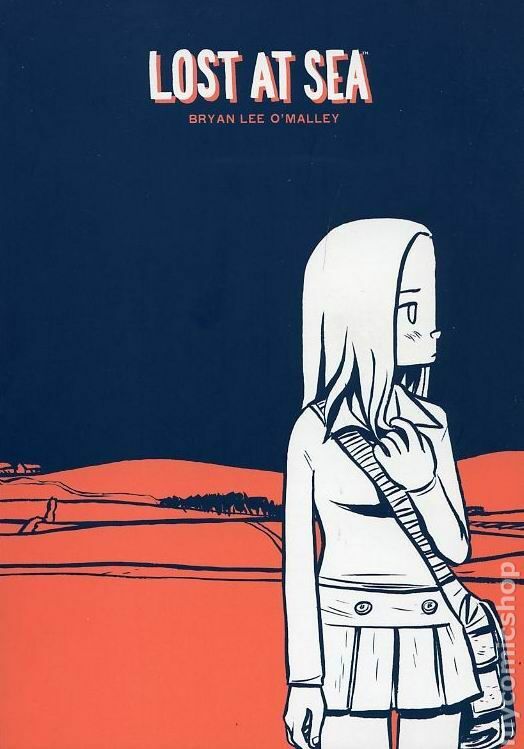 If you are a fan of any of Bryan Lee O’Malley’s books, and you have yet to read Lost At Sea, grab it. You won’t be dissapointed.